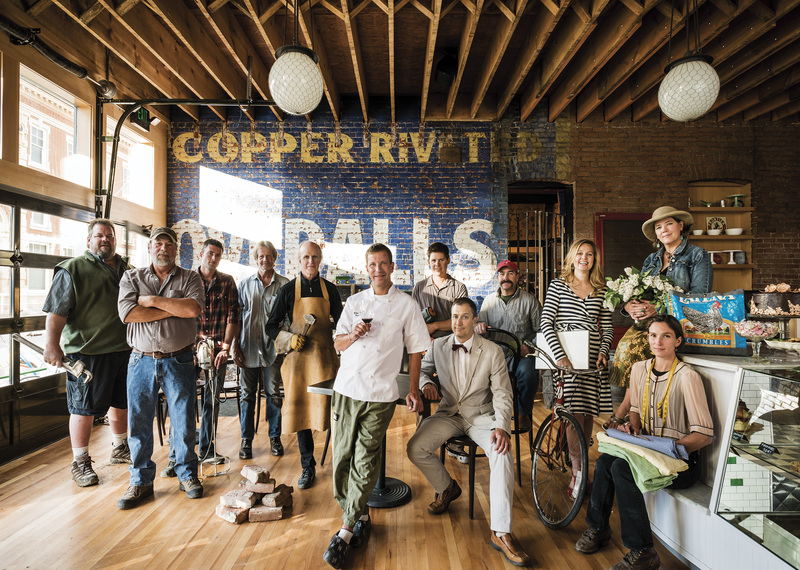 Menges’ passion to be part of the food revolution in America has made him one of the larger employers in our town. Between Gil’s Goods at 207 West Park, the adjoining Murray Bar, and his fine dining eatery, 2nd Street Bistro (123 N. 2nd St.), he currently employs 74 people. Gil’s, which is open 17 hours a day, seven days a week, is there for most of us most of the time, including Sundays, when there is a dearth of edible food in our little village. 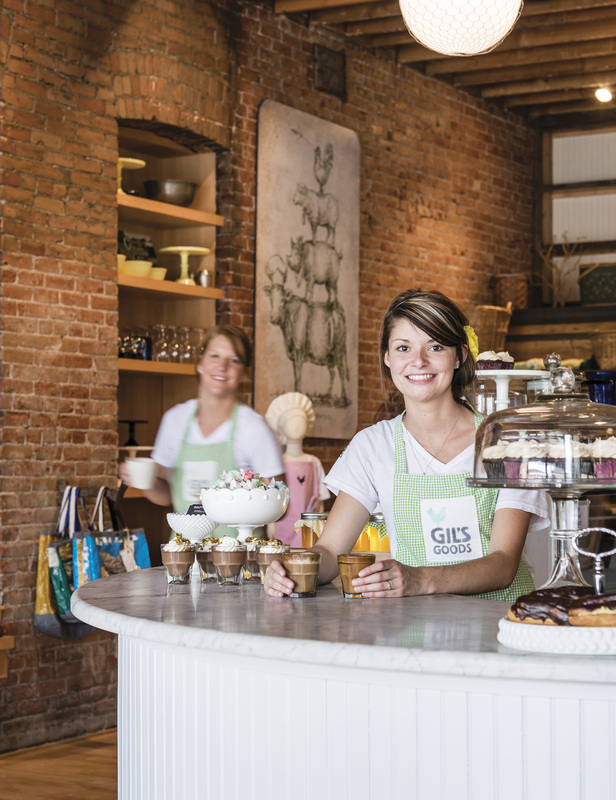 From 7 a.m. until 11 p.m., or as late as 1 a.m., if things are hopping, Gil’s serves up an assortment of delectable fare made from scratch. In the early morning, one of the wood-fired ovens — there are two in one massive 15,000-pound brick tower — is filled with delectable croissants, Danishes, biscuits, scones and bread by 20-year old baker Clinton Robbins. His 17-year-old sister Stacy, also a prodigy in the kitchen, is the queen of sweets. She makes all the cakes, chocolate truffles, cupcakes, cookies, éclairs and desserts for Gil’s and 2nd Street. The chefs cook breakfast from 7 a.m. until noon, with hearty hangover cures like biscuits and gravy, huevos rancheros and breakfast sandwiches. Then, from noon to close, the menu features options like Gil’s G.F.B. Burger (grass-fed burger), bratwurst, tomato soup, Niçoise, and my favorite, the Greek lamb kebob salad. 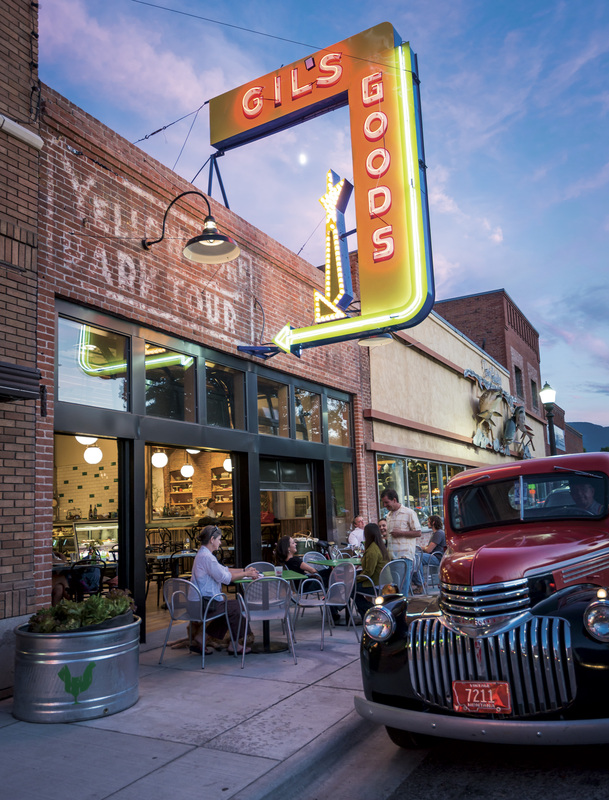 All day long Gil’s serves Livingston-made Wilcoxson’s ice cream and 13 styles of wood-fired pizza. The scrumptious pies are popular with patrons at the Murray Bar. Ordering them is convenient because a door connects the Murray to Gil’s. 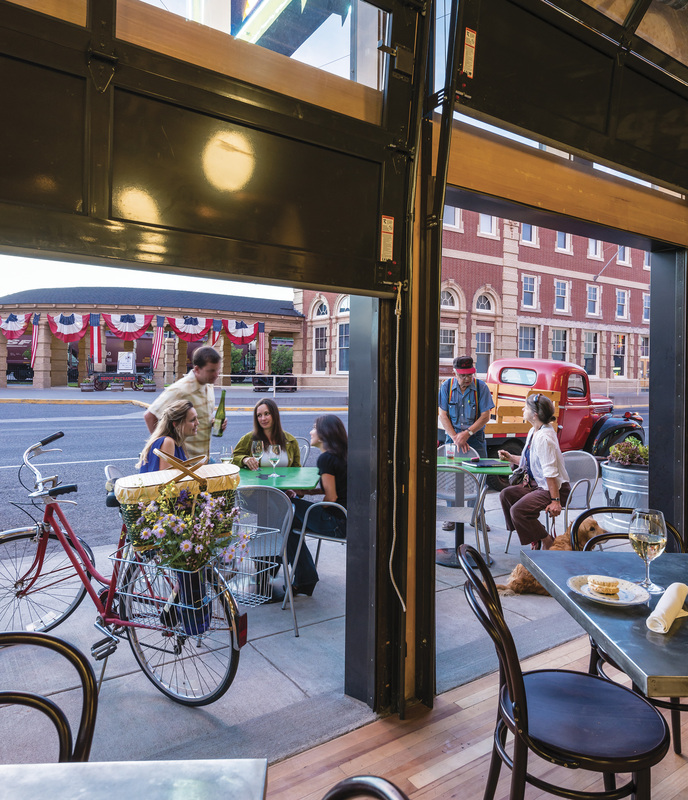 During the summer, when Gil’s opens its two glass garage doors to Park Street and tables spill out onto the sidewalk, locals might order a G.F.B and a beer from the Murray’s Margie Nelson. 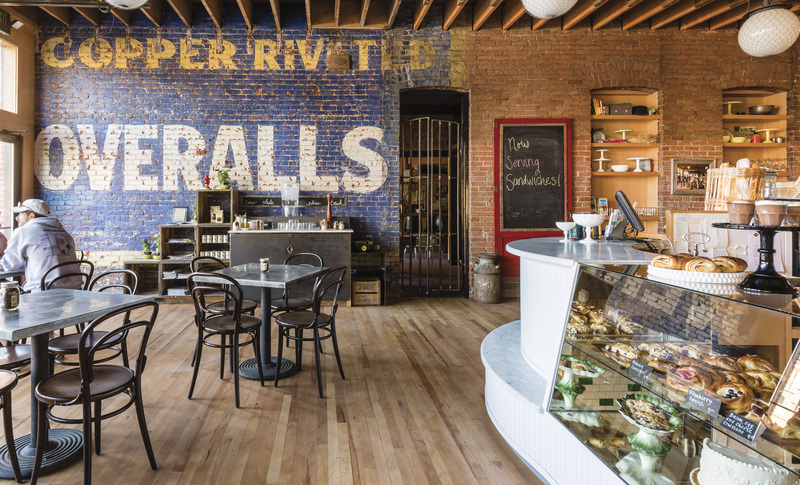 The juxtaposition between the timeworn bar and the contemporary café is appealing. The conjoined establishments not only foster a sense of community, but enable Menges’ staff to share resources. For example, the lamb for Gil’s Greek Lamb Pizza is slow-braised, then the drippings are used in a sauce at 2nd Street. The aim: as little waste as possible. This coordination is not only part of the S.O.L.E. food philosophy, it’s common sense when you are getting the majority of your produce and products from 58 local providers versus corporate food distributors. Some of what the crew can’t buy locally they grow in their own gardens. There is even a plan to build a greenhouse on the roof of Gil’s, heated via the water exchange generated by the wood-fired oven. 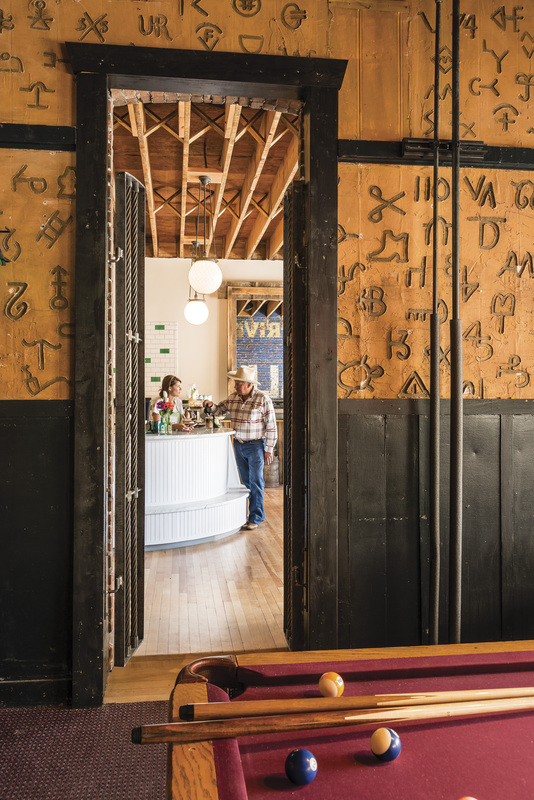 Multi-purposing translated into the café’s construction too, and the woman responsible for the style of Gil’s 1,750-square-foot space is Gigi Aelbers, of Synergigi Interior Design, a Belgian-born interior designer whose European aesthetic made Menges’ vision a reality. The look is chic. Green glass wall tiles are made from melted Pellegrino bottles, chicken wire globes encase the ceiling lights, and steel cable from a decommissioned Bridger Bowl Ski Area chairlift adds support to architectural features. Such ingenuity is fitting for our historic railroad town where many houses were built from scraps discarded or stolen from the Northern Pacific Railroad. Even the café’s name is adopted. Gil’s Goods used to be a “rubber tomahawk shop” that sold post cards, Montana agates, and “Indian” arrowheads to tourists; the shop’s motto was “Gil’s Got It!” Now the restored Gil’s Goods sign, a bright yellow angle with a green bulb-lit arrow, points you inside for a Café Corto instead of a trinket. 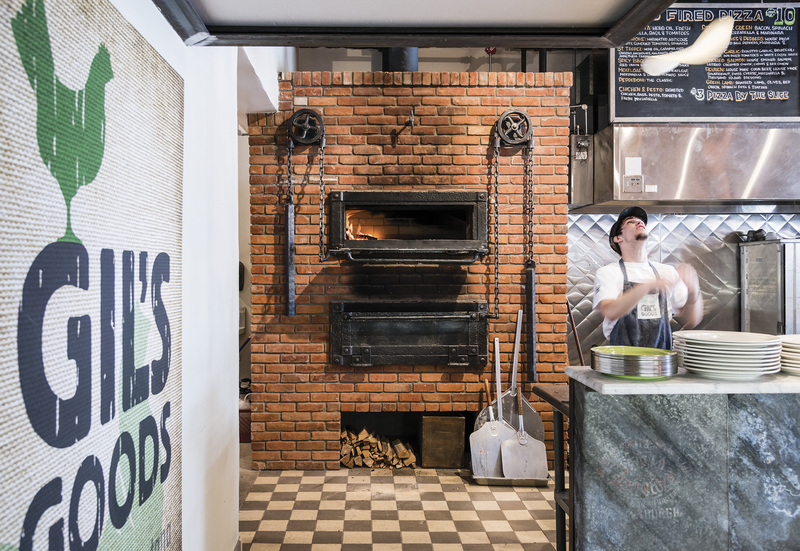 At Gil’s Goods you will not find Coca-Cola (try next door), nor lettuce or tomato on the burger, because Menges is trying to “teach people to eat with the seasons,” but the tasty food and commitment to S.O.L.E. is why Gil’s Goods suits our quirky town. Gil’s has still got it! And it’s good. 1. Place all flour in mixing bowl. 2. Measure out sugar, yeast, salt and pepper and add to flour. 3. Dissolve honey in water and add oil. 4. Combine all ingredients and mix in a stand mixer until smooth dough balls form, about 8 minutes. dough into two thin rounds. 1. In a saucepan combine milk, onion, cloves, bay leaves and thyme. 2. Warm on the lowest flame possible for 30 minutes to an hour. Stir occasionally. 3. Increase to medium heat and bring to a low simmer, stirring constantly. 4. Begin adding roux, whisking thoroughly to combine. 5. Once desired consistency is reached, be sure all flour is cooked out. 7. Combine parmesan and white cheddar in a large mixing bowl, place into a bain marie. Place a strainer on top of the bowl. 8. Strain bechamel through the strainer into the bain marie bowl. 9. Press all sauce through. 10. Remove strainer and discard contents. 11. Whisk to incorporate cheeses into bechamel. 12. After mornay is complete place contents in a blender with roasted garlic, puree. 13. Serve on pizza and enjoy. 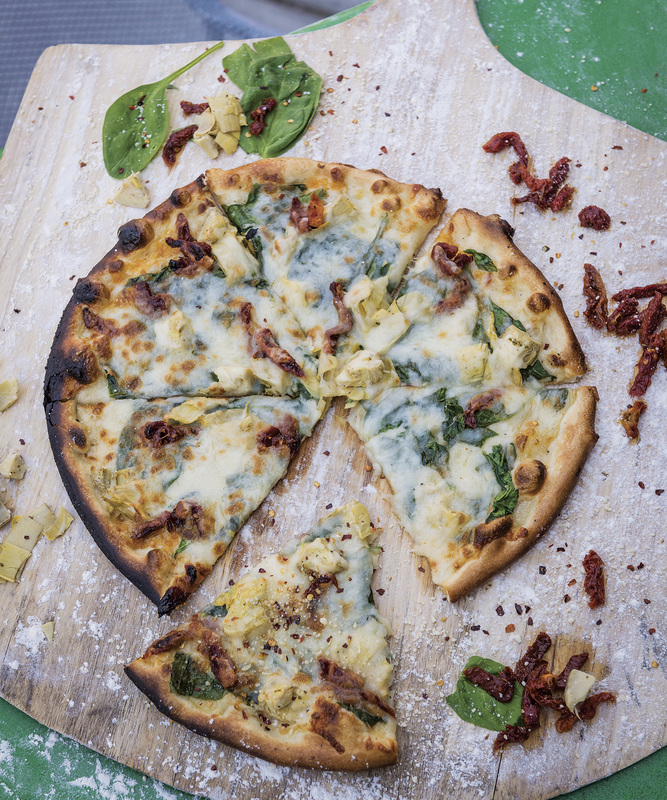 Spread mornay on pizza dough, all the way to the crust. Place ingredients evenly all over sauce. Top with shredded mozzarella and bake at 400 degrees until crust is golden brown.